A while ago, a magazine I subscribed to had attached to it a Menu Planner ... out of all those 'bits' you get along with magazines these days, this has got to be the most useful to me. Do you get tired of wondering what s for dinner at the end of the day, and you stand in front of the fridge or the pantry and you are missing just one ingredient? I used to, constantly ... the kids would always ask "whats for dinner?" .. I was so sick of that question. So after a visit to a friends place who had her weekly meals up on a board in her apartment and the attachment from the magazine, it was a sign to do the same. It has made such a difference. I plan at the beginning of the week whats for dinner, shop for the week and best of all no more "Whats for dinner, mum" ... So I not only save on my shopping bill because I buy only what I need, and my sanity is saved too :) .... 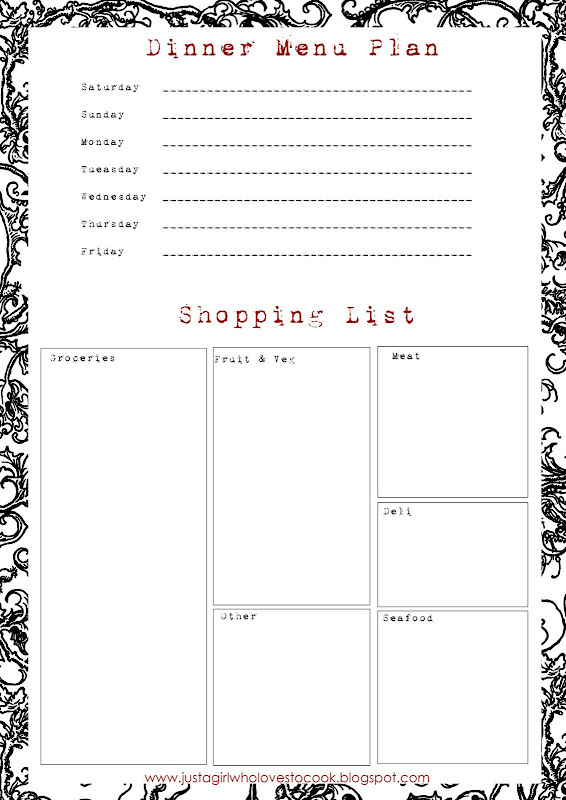 So here is a menu plan, for dinners, and an empty shopping list, so you can do your own menu plan, then fold away the shopping list and pin it to a board or the fridge, so you and the kids know exactly whats for dinner that night ..
Yay, you are back! Love this! Please share your weekly menu plan... I could use some inspiration.